As a beekeeper you know that sometimes you’ll find a surprise inside your hive. I’m not talking about bees, but other small creatures that take up residence inside a beehive since it is a dry, warm place. 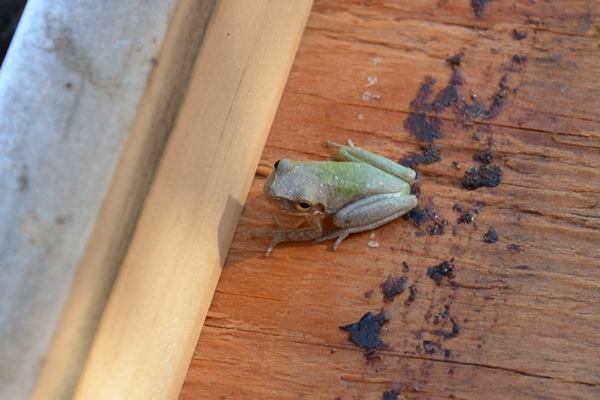 We always open our hives with caution because these critters tend to hang out under the lid of the hive. These spiders are the largest jumping spider in eastern North America and commonly found in Florida. 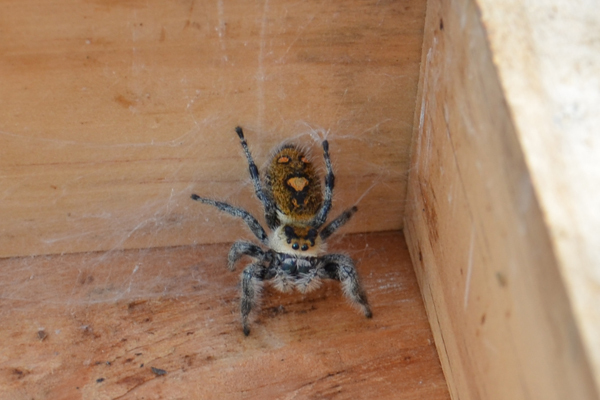 This particular spider pictured above is an adult female in orange coloring. They are harmless to humans. We tend to find them in the inside corners of the lids. This frog was very cute looking at me. With the humid tropical conditions here in Florida, we find these little guys all the time under the edge of the hive lids. They are good to have around because they will eat moths. 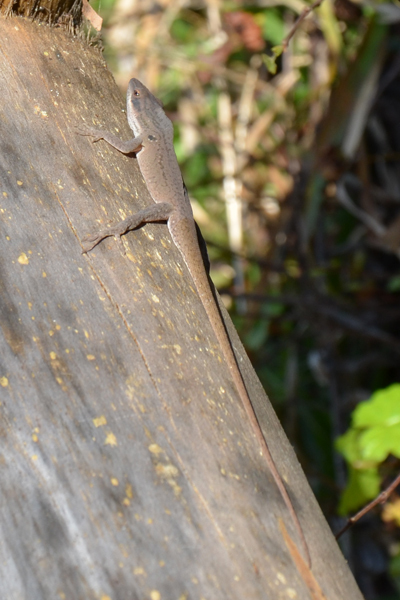 Lizards are everywhere here in Florida. We have lots of Carolina Anoles and Brown Anoles. This lizard pictured above can change color from brown to green. They are also good to have around because they will eat moths and small insects. Again, we usually find them under the edge of the lid. Now it wouldn’t be Florida without cockroaches! Yes, I hate them, but they are here to stay. They like damp and warm environments. 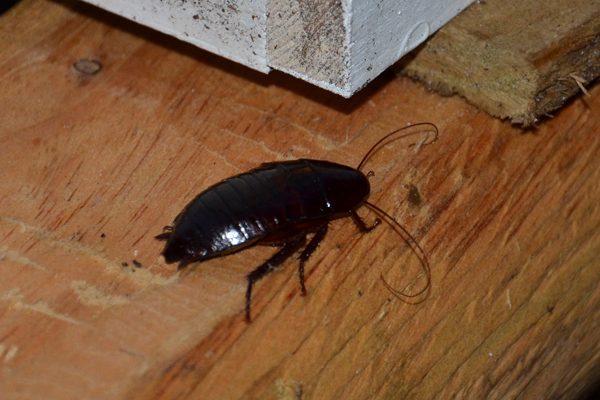 This particular roach picture above is an adult female. The females have a “V” notch at the end of their body. We tend to find these inside the hive between the lid and inner cover. Finally, for the first time ever I spotted a scorpion! It was crawling on the wooden pallet our hives sit on and it hid under the beehive before I could get a picture, but I did get a good look at it. It was a Florida Bark Scorpion. Yes, they do look scary, even the small ones. 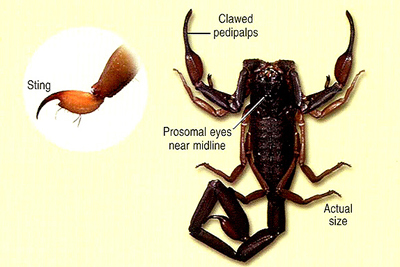 This scorpion can sting, but is not fatal to humans. Do you have any creatures that like to hang out in your beehives? I’d love to hear about them.